I recently saw this rice topping in Facebook when a friend of mine shared this drool worthy recipe from Certified Foodies, I was so intrigued as I haven’t tried them yet but it looks so good hence I did my own research in the hope of recreating it at home. After reading handful of recipes online looks like all of them reverse engineered the recipe meaning it’s mostly a guess work, so no one knows the real recipe of this Cebuano favourite. I grabbed some ideas on most of these websites I saw and applied what I learned from the Chinese cuisine, so here I am making my own version and hopefully someone out there who tasted the original tries this out and let us know if it is the same. 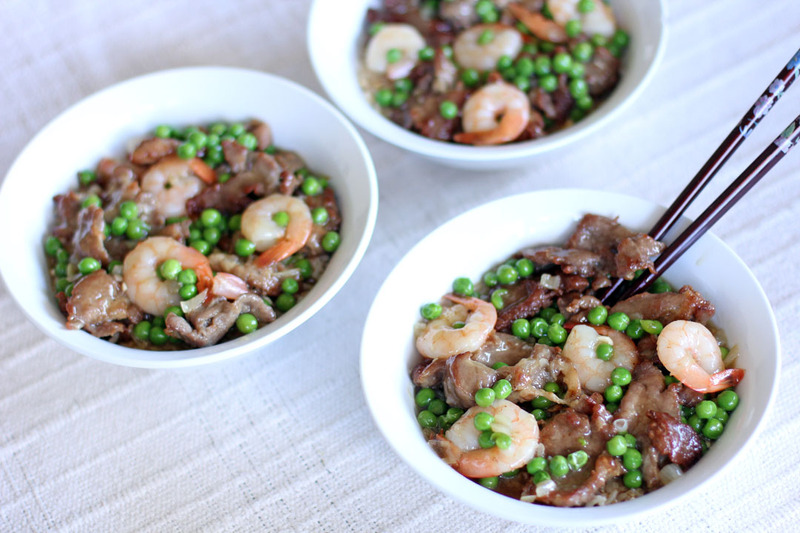 Most of the recipes online calls for pork, prawns and green peas so I never changed any of these. I noticed the pictures of the original ones have this thick starchy sauce which resembles the properties of tapioca starch as opposed to cornstarch as commonly used by the recipes I saw so I changed this one, having said that the sauce on the images I saw looks like the ones used on Maki sold in Binondo which definitely uses tapioca starch. Another change I made is how I processed the pork, most recipes just instruct to thinly sliced them but eating a lot of Chinese dishes tells me the texture I saw on these photos are not simply sliced and it looks like it was tenderized by a cleaver and quick fried to get that fluffy texture, doing it this way will also makes it easy to bite. I also saw some recipes that uses egg fried rice as the base, this seems to be highly plausible as some Chinese dishes that are twice cooked rice toppings uses egg fried rice as its base like the popular Hong Kong Baked Rice, so this technique was also used on my recipe. Finally basing on the name alone it looks like it was steamed prior to serving so I did that as well. That’s it! I am not sure if this is how it’s made but like what I said these are my observations and hopefully it resembles the real thing, anyways if I am wrong with my assumption then this is one delicious mistake. Tenderize pork pieces using the back of a cleaver, place in a container together with baking powder and some salt, let it marinate for 15 minutes. Place corn flour in plate then lightly coat the pork pieces. Prepare a wok, add enough oil for deep frying then once its hot deep fry pork pieces in medium heat for 2 minutes or just until golden brown. In a separate wok add oil then sauté garlic, ginger and shallots. Bring heat to high then add the Chinese cooking wine, soy sauce and chicken stock. Bring to a boil then add the pork, continue to boil for 5 minutes. Combine and mix well water and tapioca starch. Still in high heat add the prawns, green peas and tapioca starch slurry, continue to boil for 3 minutes or until sauce becomes thick. (You can adjust the thickness of the sauce to your liking by adding more tapioca starch or more water). Turn heat off then add the sesame oil, season with salt. Prepare your egg fried rice, Using a wok heat up oil until it nearly reaches its smoking point. Add rice and salt and stir fry for a minute. Make a well in the middle of the wok then pour in beaten eggs, once cooked mix in together with the rice. Remove from heat then set aside. Place egg fried rice on bowls, then press it firmly to the bottom. Top it with the cooked meat mixture, place on a steamer and steam in high heat for 7-10 minutes. Remove from steamer then serve immediately. I’ve seen this rice being offered in Chinese restaurants but I haven’t tried it yet. Your version looks superb!!! I’ve never made a rice dish I didn’t like! This looks superb — thanks so much. My best friend is from Cebu! I bet she would love this dish. 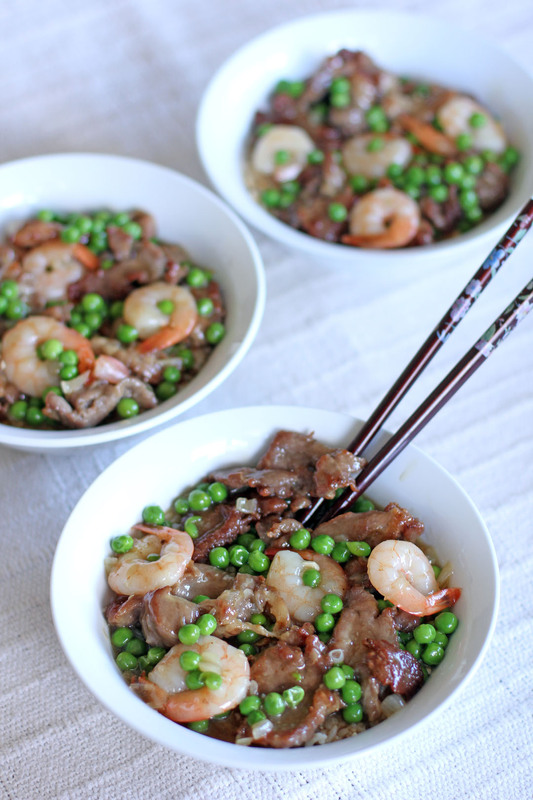 This rice dish looks delicious with the pork and prawn on it…I love the egg fried rice…yum! Another delicious and unusual rice dish Raymund. Thanks! I use the Philippine Soy Sauce called Datu Puti, click on the link to see how it looks if you haven’t seen it yet. If you cant really find it then the next best soy sauce to use is Kikkoman. They are less salty than the light soy sauce and have a bit of sweet taste to it. What an excellent outcome from your mistake! I’ve never tried it before but cebu style steamed rice is going to be on my menu this weekend. Thank you!